Flint Water West? SDUSD Supt. Marten and Board Covered Up “Lead in Water” Investigation for SEVEN MONTHS!!! When Parents send their students to San Diego Unified School District (SDUSD) schools, they do so with a solemn trust that their children will be kept safe and healthy under the care and management of the elected Board of Education and their appointed Superintendent. When school site Staff go to work, by law and by contract the SDUSD is mandated to provide a safe and healthy workplace under the care and management of the elected Board of Education and their appointed Superintendent. a) Tell your family to drink and use bottled water. b) Don’t tell your family about the lead in the water, let them use the water and gamble that they wouldn’t be poisoned. Superintendent Marten and Board Members Richard Barrera, Kevin Beiser, John Lee Evans, Mike McQuary and Sharon Whitehurst-Payne apparently chose “B” for all SDUSD Students and School site Staff. That decision betrayed the basic, primary, trust and mandate of a safe and healthy SDUSD learning and work environment of SDUSD senior leadership. Marten and the Board hid tests that showed lead in water at SDUSD campuses and did not warn Students, Parents of Site Staff for 7 MONTHS rather than allowing them to protect themselves with bottled water. In a shocking report by reporter Wendy Fry of 7News San Diego, the SDUSD discovered lead in the water at Euclid Elementary in September, 2016 but did NOT fully warn or notify Students, Parents or site staff at Euclid or any other SDUSD schools of the potential health risks of lead in the drinking water on campuses until a huge propaganda event in April, 2017. The 7News San Diego report shows the full depth of the negligence by Superintendent Marten, the Board and the Public Relations Propaganda Department by not warning of the “lead in water” risk to ALL SDUSD Students, Families and Site Staff at all campuses until all campuses could be fully tested. At Euclid Elementary in Mid-City, tests found lead in the water in September 2016, ranging from none to 38 parts per billion to 240 parts per billion, which is 15 times higher than the amount considered alarming by state and federal regulators. But, before that public process began, the district wanted to see where it stood. So, it conducted some preliminary water quality sampling, finding dangerous levels of lead contamination in at least one elementary school. The district did not tell parents. In other words, while Marten and the Board were totally mismanaging the SDUSD Budget to the tune of a $124 millon deficit, they were gambling with the health of Students and School Site Staff at the same time!!! For some SDUSD Staff they not only lost their job, they could have lost their health. 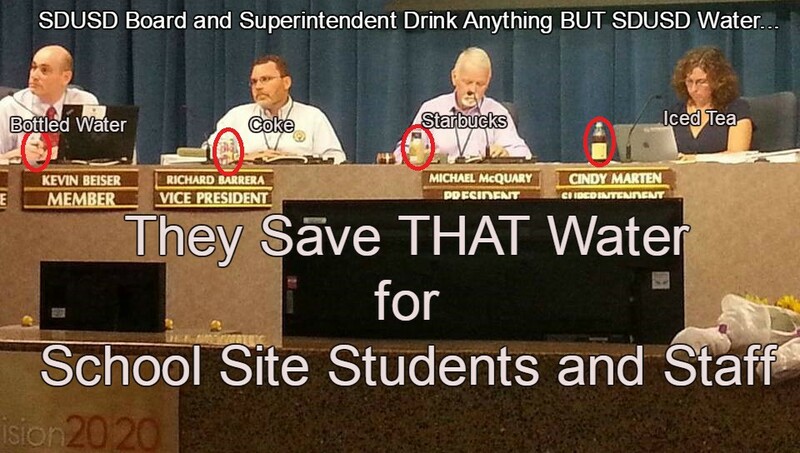 Thank goodness that this time the gambling Superintendent and Board, who lost the ridiculous $50,000 Scripps Ranch High School AP Lawsuit bet, actually WON the bet that they didn’t knowingly poison all SDUSD School Sites with high levels of lead in the water. Unlike Flint, there are no reports of Students or Staff illnesses related to the lead in the water…so far. After reviewing the job description of the Superintendent and Board along with all the Federal, State and SDUSD laws, bylaws, procedures and processes, District Deeds did not find the authority anywhere to gamble with Student and Schools Site Staff lives through not notifying them of a serious health risk on campus. District Deeds wondered what could motivate Marten and the Board to cover up the the announcement of lead in water for 7 months. All we can figure is that the District was trying to avoid bad press and replace it with a timed, calculated Propaganda event with the announcement of being a national “trailblazer” for school site lead testing as described in the 7News article. If Supt. Marten and Board were aware of this coverup, they should resign immediately. If Marten DID NOT TELL the Board about the lead discovery in September, 2016, like she didn’t tell them in the EMail Deletion Policy debacle, Marten should be terminated immediately. How much longer will the Board of Education allow the destruction of the SDUSD physical and fiscal health to continue under the Marten Administration? Ask Board Members Richard Barrera, Kevin Beiser, John Lee Evans, Mike McQuary and Sharon Whotehurst-Payne that question the next time you see them.